Our semi-frameless trailer combines the features of our frame type and frameless models. What makes the semi-frameless special is its ability to perform like a frame type without the added weight. It is frequently used for many of the same applications. (half-frame) Tandem Semi-Frameless: 18" Steel I-Beam with 6" x 1/2" flange and3/8" web. Tri-Axle Semi-Frameless: 5/8" flange x 3/8" web aluminum alloy 6061-T6 to a depth of 18" full length. Draft Arms 4" x 7" rectangular tubing with .186" wall with fail-safe strapped end steel bushings. Landing Gear Stiff legs: 3.5" square tube x 3/16" wall upper, 3"square tube x 3/16" wall lower with sand shoe. 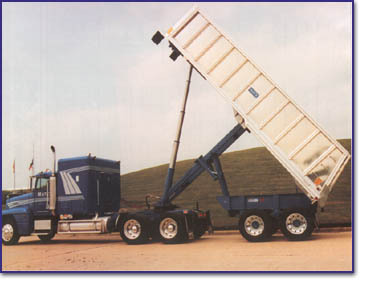 Suspension Four Spring: Hutch H-9700; 50,000lb capacity; 6 leaf full span axle-to-axle. Steps Four(4) up nose, two(2) on left rear, three(3) on tailgate. Our semi-frameless trailer combines the features of our frame type and frameless models. Frequently used for many of the same applications as the frameless.